Last year, one of my favourite beauty retailers, Cult Beauty, came out with a Fall Goody Bag, containing full- and sample-sized products. Among them was a set of four sachets from a brand I had never heard of before - Allies of Skin, who are based in Singapore and manufacture in the United States. There were two sachets of an Overnight Mask, and two of the All-Day Mask. Not being a huge fan of foil sachets, I put them away in my travel bag. And then, one weekend away at my Gramps's, I saw the sachets and opened the Overnight Mask, applied it, and went off to sleep. 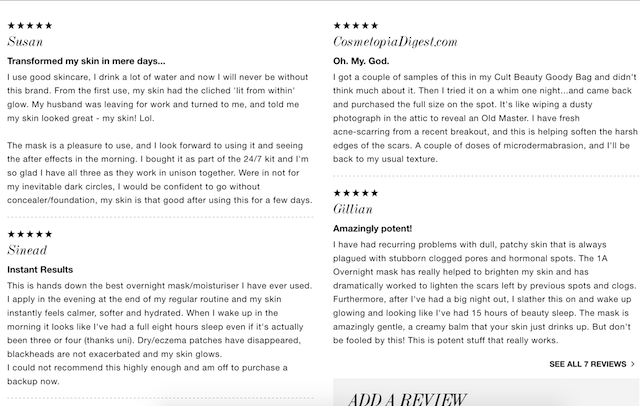 What I saw the following morning made me head over to Cult Beauty and buy the full sized tube immediately, and leave a review, which I now feel was understated. 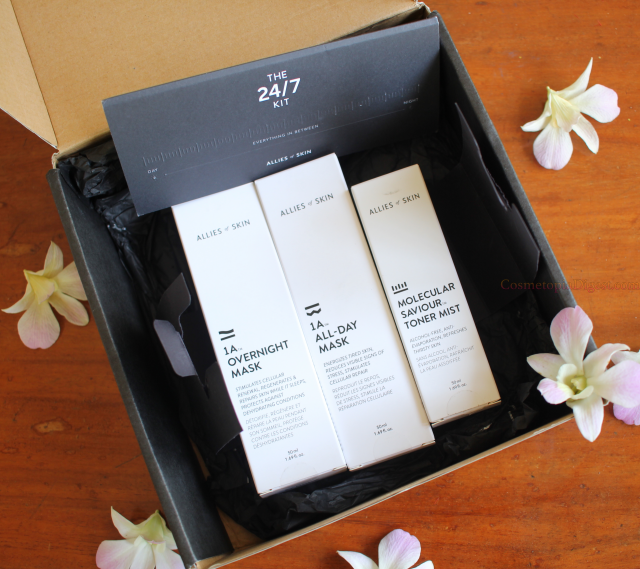 Scroll down for more on the Allies Of Skin 24/7 Skincare Kit. 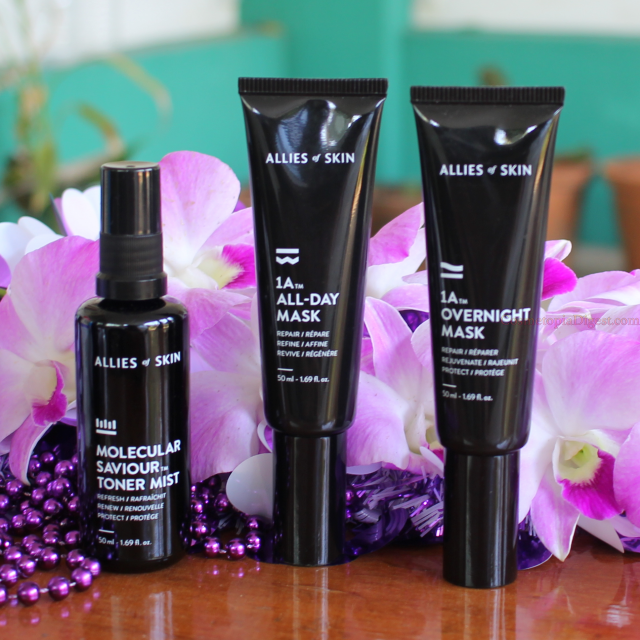 Allies Of Skin, as I said, is a Singapore-based brand, though all the manufacturing is done in their US labs. The cruelty-free brand was founded by Nicolas Travis, who graduated in Biomedical Sciences. As a student, Travis struggled with cystic acne. It was while searching for non-comedogenic products that the germ of the idea took root in his mind. He then went on to complete his Masters' in Business, where he outlined a plan to start the skincare line conceived during his science education. The products do not contain silicones, mineral oils, petrochemicals, paragons, polyethylene glycol, sulfates, GMOs, triclosan, DEA/TEA, phthalates, drying alcohol, synthetic dyes, or fragrances. Of these, the Molecular Saviour-Toner Mist is meant to be used first, right after cleansing, both in the morning as well as the evening. In the mornings, this is to be followed by the 1A All Day Mask, while you need to use the 1A Overnight Mask in the evenings. All three products can be worked into my usual skincare routine, and used alongside other products - I now use the Mist right after a BHA toner, follow with a mild serum, and then use the All-Day Mask in the mornings before putting on makeup. In the evenings, I use an AHA toner, the mist, an essence, a serum, the Overnight Mask, and then seal the lot in with a facial oil. Allies Of Skin says that the Overnight Mask reduces acne lesions by around 67% in 28 days, while the mist reduces lesions by 42%, and the All Day mask decreases acne lesions by 36%. Here is the review I wrote on Cult Beauty. I have used the Overnight Mask before, and the other two products are new to me. That said, I had not recorded the differences on my skin regularly. This time around, I will be using these three products every day and recording the changes. This is not a review post. That comes in a month's time, along with more details, and before- and after- photos, as you have to see the transition to believe it. Allies Of Skin have asked me to take the challenge, and keep track of the changes on my skin as I use the masks every morning and evening. So, this being the 18th of January, I'll be posting my review a month later - around the 20th of February, since the 18th is a Saturday. I'll be documenting my before- and after- photos, including up, close and personal views of my acne scarring. Stay tuned for that. Till then, do check out more on Allies Of Skin's story, and their ethos here.